Announced and demoed last week on stage at Apple’s media event, Pixelmator for iPad is a powerful portable rendition of the popular (and award-winning) image editor for Mac. I’m no photographer, and I’m definitely no artist, but I wanted to get my hands (quite literally) on Pixelmator for iPad since I watched the demo video. As someone who works primarily from his iPad mini and is about to upgrade to a full-sized iPad Air 2 with faster hardware, I was eager to try this new portable version of Pixelmator for basic image editing and photo retouching needs. 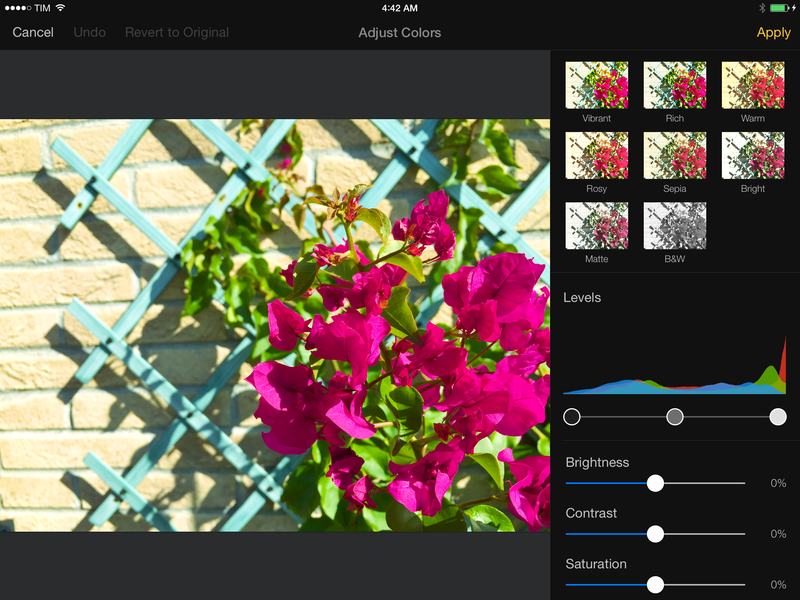 I’ve always wanted a lightweight but powerful image editor on my iPad: I could never get used to the interface oddities of Adobe’s Photoshop, and drawing-oriented apps such as Procreate didn’t fit my needs. 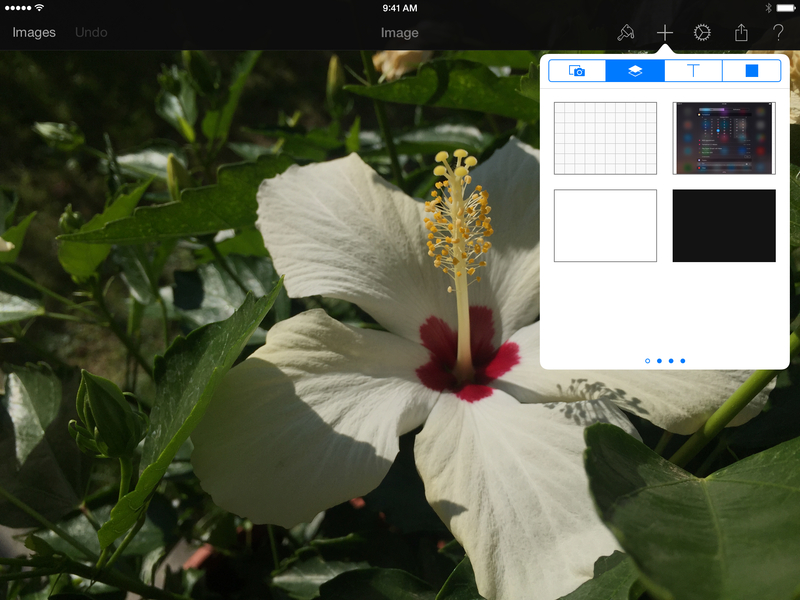 I’ve only spent 24 hours with Pixelmator for iPad, so don’t consider this a review. And even if I had more time with the app, my limited perspective and use case wouldn’t allow me to offer a comprehensive look at the app. For that, take a look at Pixelmator’s new website and tech specs webpage. 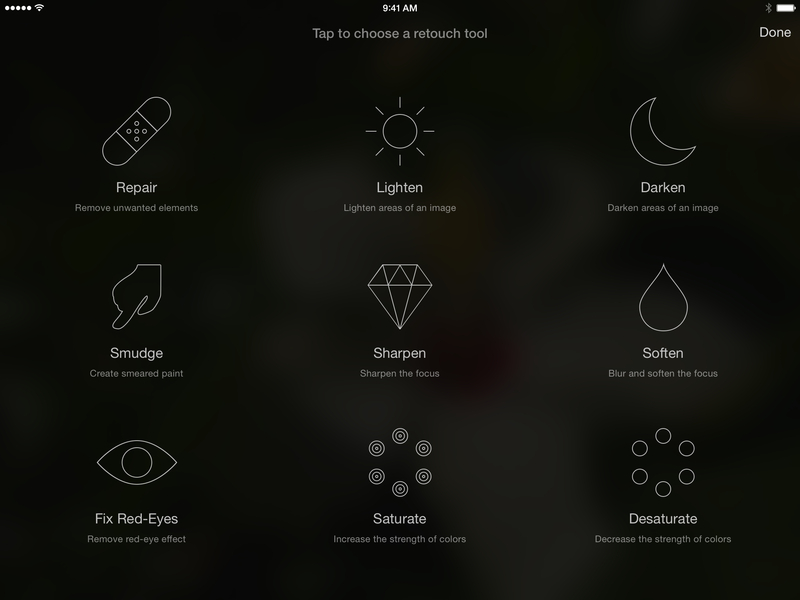 Below, you’ll find a brief collection of notes and thoughts on Pixelmator for iPad after 24 hours of testing. The main screen of Pixelmator for iPad is an iWork-like visualization of all your documents, which sync with iCloud (you will find plenty of similarities with Apple’s iWork suite in the app). You can tap on the big “+” button to create a new image, but you can also import files from other sources. 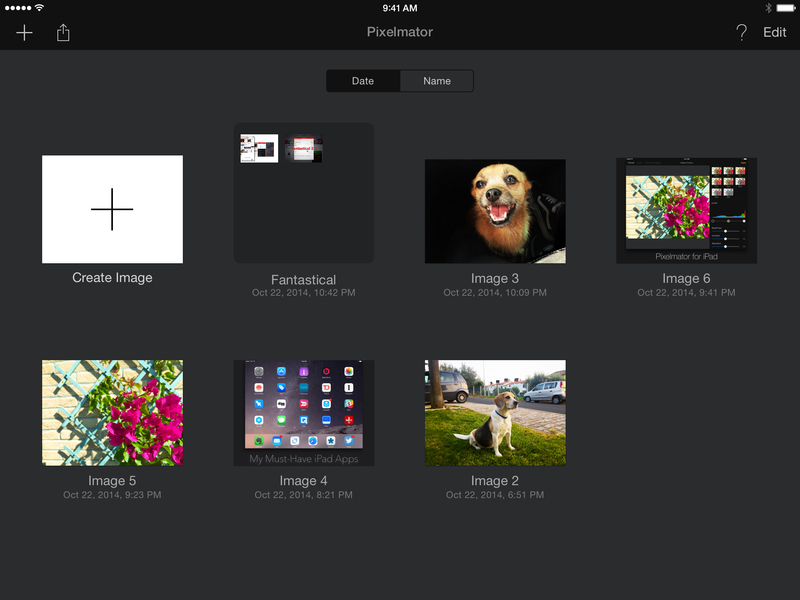 You can import photos from your library, take a new photo, or open files from iCloud Drive. If you have photos stored in the Preview or Readdle Documents folders on other devices, you can import them in Pixelmator. But that’s not all: tap Locations, and Pixelmator will have access to any other document storage provider, such as Transmit or Dropbox. A great way to make your photos pop more with only a few taps is the Adjust Colors screen, which offers presets, control over levels, curves, sliders for colors, brightness, contrast, and more. In my tests, I imported a couple of photos I shot in daylight with my iPhone 6, cropped them to focus on the subject (our dogs), played with the Vibrant and Rich presets, and tweaked a few sliders for brightness and color balance. The animations and color pairings in this screen are elegant and tasteful. 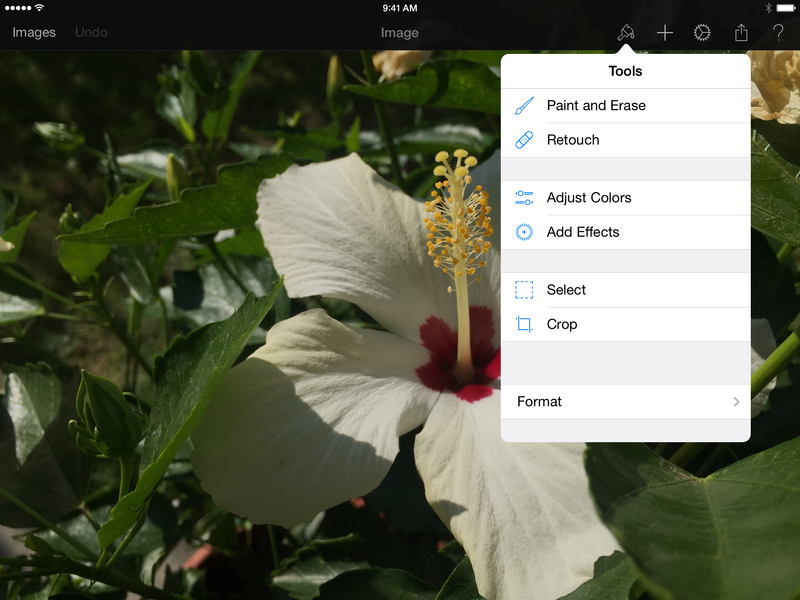 My favorite aspect of the app is the set of retouch tools it brings to the iPad. You can choose from 9 retouch tools which you can apply with a finger on a photo to, say, fix something in the background, remove red eyes, or blur and soften specific areas. I was most impressed by Pixelmator’s repair tool: I tried it out of curiosity to remove yellow spots of grass and other unwanted elements from a photo of my dog, and it worked perfectly in just a couple of seconds. I know that these features have been available for years in professional desktop applications, but the ability to repair a photo in two seconds on an iPad with an app that costs $4.99 is fairly amazing to me. I’ve also been trying Pixelmator for images and banners I could use on MacStories, and I like how the team translated layers and styles to the iPad’s form factor (again, note that I never used Photoshop; I like and use Acorn on my Mac). You can swipe from the left edge of the screen to show layers, which you can rearrange and group with tap & hold or tap to show options for duplication and styling. Arranging layers on screen is intuitive thanks to guides and handlers for resizing, and it takes seconds to line up a background with a photo and perhaps a couple of text layers. Styling is also done nicely on the iPad. Select a layer, hit the paintbrush icon, then go to Format and you’ll see two sections for Style and Arrange. Style features the usual suspects – shadow (with support for blur), fill, stroke, etc. – while Arrange shows the current layer’s size in pixels (which you can tap to adjust) and buttons to rotate, flip, and move to back/front. This popover gains a new tab when a text layer is selected, where you’ll find fonts (over 70), size controls, colors, alignment, and other settings. I appreciate the simplicity involved with creating a new text layer, giving it a shadow, tweaking the font, and adding a blurred shadow to it. You can quickly import an image from the iOS clipboard and turn it into a layer without having to do any further copy & paste in the app. While in editing mode, tap the “+” button in the toolbar, select the layers tab, and the top-right thumbnail will show you an image you’ve previously copied, allowing you to insert it as a layer. I tried this feature in several ways: I copied a photo from the Photos app, I copied from Safari, and I also copied from a Messages conversation; Pixelmator offered to turn the clipboard image into a layer every time, which saved me time. This is a great little shortcut to create images using assets from different sources. 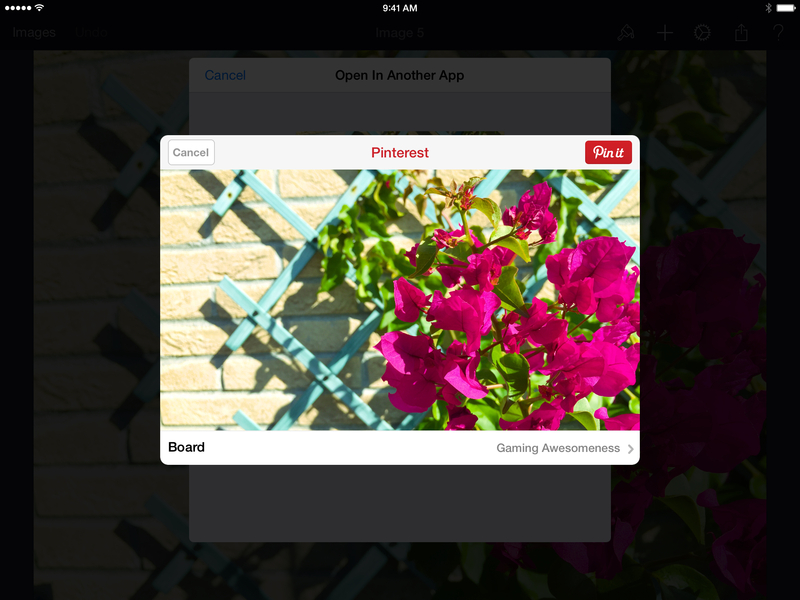 If you’re working on multiple projects, you can organize images in folders in the main screen of the app. 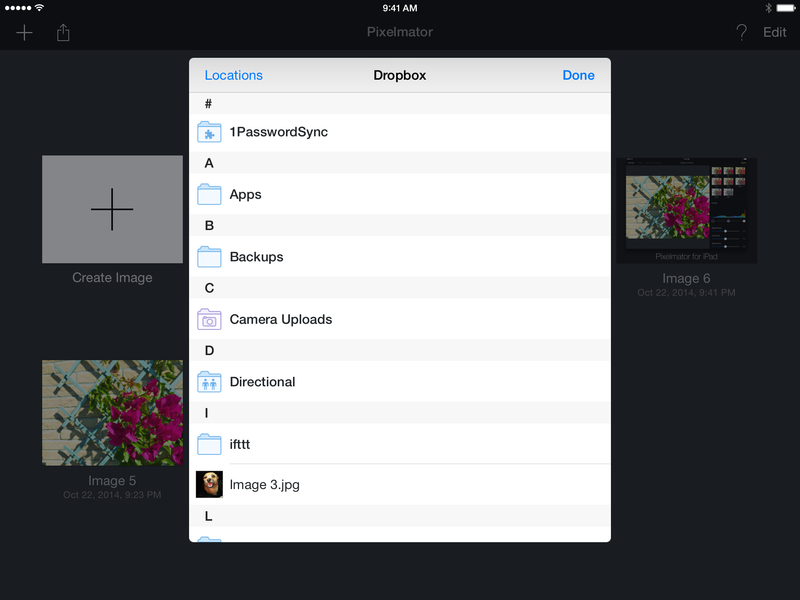 Using drag & drop like you’d do on the iOS Home screen, create a folder from two images and then drop other files in it. Pixelmator doesn’t have a custom template feature yet (or, at least, I couldn’t find it), but you can use folders and the Duplicate feature to store template files in a dedicated location. Speaking of templates, the Create Image screen provides a good selection of downloadable templates that you can use to get started. There are several templates for frames, cards, posters, collages, and more. I’m not sure I’ll ever get to design a poster for a party, but you’ll never know with these things, and maybe Pixelmator will come in handy for that. The templates are nice. Pixelmator is a good iOS 8 citizen and, besides importing files, it supports extensions for exporting images as well as applying effects. Let’s start with the latter. 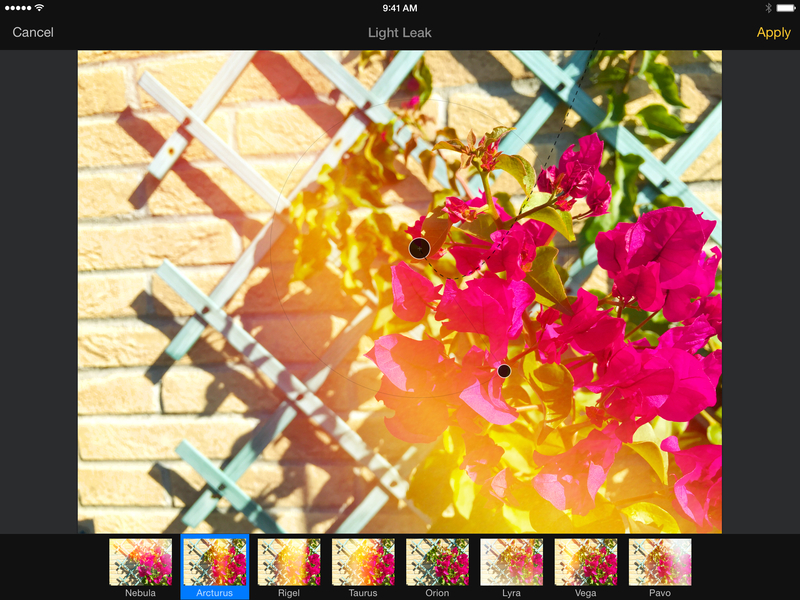 Pixelmator has an Effects feature that lets you apply filters to images with one tap. These include the obvious B&W, Sharpen, Vignette, as well as more peculiar ones such as Light Leak, Bokeh, and Vintage. Some of the effects contain sub-effects: B&W has seven types of black & white filters, for instance, which look much better than Apple’s. You can apply these filters in the app and then continue editing, or you can bring up Pixelmator’s Effects UI in the Photos app with a photo editing extension. I prefer to apply filters in Pixelmator because then I get to keep editing with other tools that aren’t available with the extension. You can save files to iCloud Drive or other storage providers enabled on your iPad, or you can bring up the share sheet, which will show you all your installed share and action extensions. 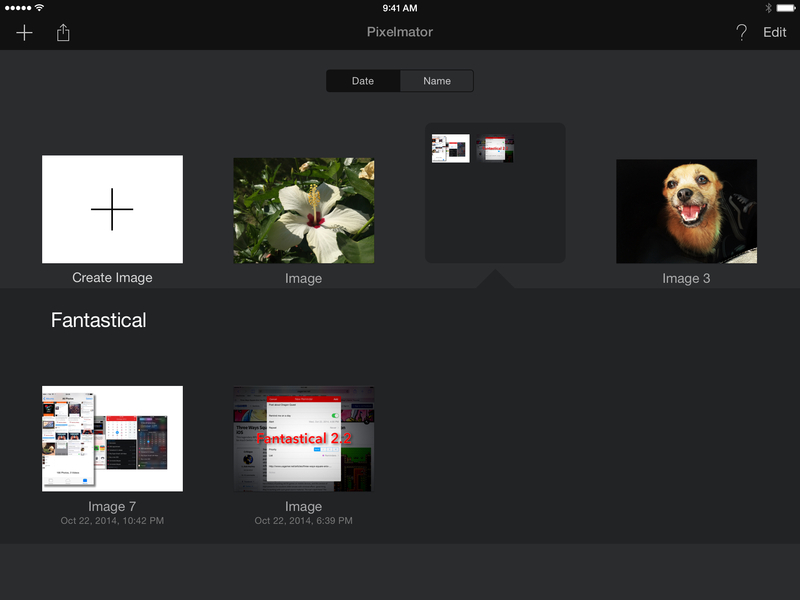 The Pinterest extension in Pixelmator for iPad. I can pin images to Pinterest or post them to Slack without leaving Pixelmator, and it’s amazing. 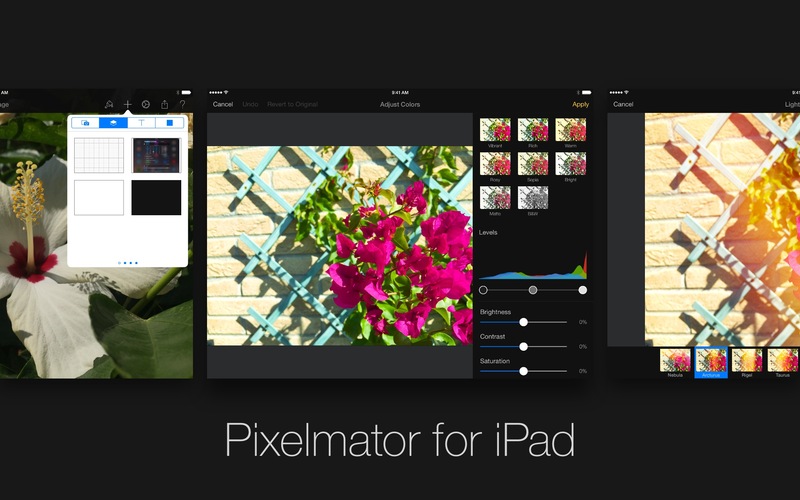 For best performance, the Pixelmator team recommends an iPad 4 or later. It’s clear that Pixelmator was primarily intended for modern Apple hardware: I’ve been testing the app on my iPad mini 2, and it’s fast and smooth. Some large images take a while to load (buttons are not responsive during this process) and the Repair tool may need a few seconds depending on how much you want to magically fix, but the A7 holds up well. I guess that the iPad Air 2’s A8X can give Pixelmator a serious hand when it comes to heavy images with plenty of effects and assets. A final note on Pixelmator’s debut on the iPad: it truly looks and feels like the image editor Apple would make, and I mean that in the most positive way. The UI is simple, cohesive with the rest of iOS, and it is remarkably familiar with other Apple apps in many areas of the interface. The Pixelmator team did a great job in adapting the floating controls of the desktop version to the iPad, crafting a UI that puts the spotlight on images without causing confusion. The use of popovers and gestures feels just right on the iPad, and manipulating content directly on the Retina display makes for a fantastic portable image editing experience. 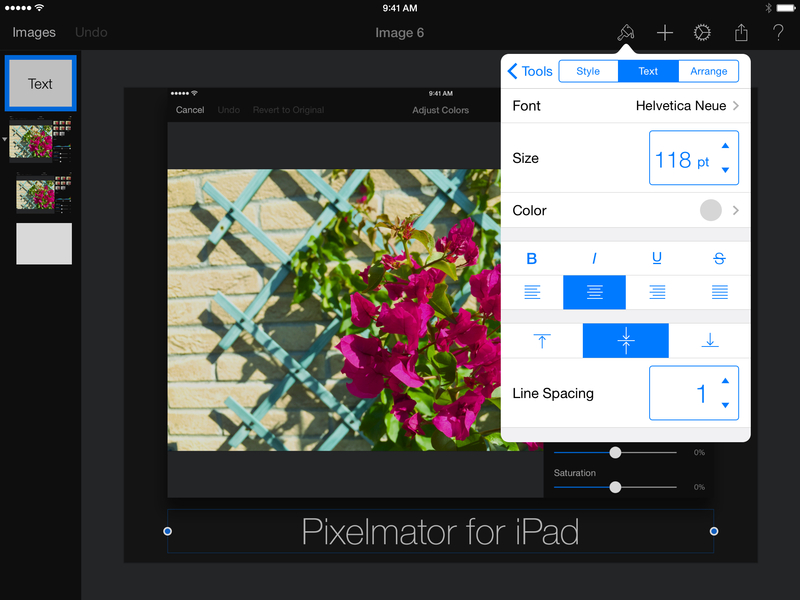 Pixelmator for iPad will be available at $4.99 on the App Store today.